Well, it looks as though we have ourselves a race in the Draft. Thanks to the best week of points we have seen in the Draft this year (521 points), we saw the lead go down to 4 points, second and third are tied in points and have to use the goals tiebreaker to settle things, fourth place is only 3 points out of the money, and fifth is only 4 points out as well (7 out of the money). With eight weeks to go, I think we have one exciting pool to look after down the stretch. Let's also look even further down the line, as even ninth place in the Draft is only 31 points out of first, which shouldn't be too impossible to overcome at this point, as John P., who sits in ninth, leads the way out of the second Waiver Draft, having 71 points in the first two weeks after said Waiver period. Our leader, John B., is second-last in that department with only 37 points, which is already a 34-point gain in only two weeks. Sure, I don't think that kind of pace can remain, but stranger things have happened. Let's hope we see one hell of a finish... and be sure to get on the Trash Talk page as well! There's nothing better than throwing your weight in garbage around in terms of smack talk. "Boo! You're all rubbish!" With the return of Sean Avery to professional hockey, I thought I would ask you, the reader, whether or not you would want the agitator on your favourite NHL team or not... hoping that it isn't the Rangers. Avery has joined the Hartford Wolf Pack of the AHL, the Rangers AHL affiliate, with the understanding that the Rangers are interested in acquiring him full-time. Well, the response was enthusiastic, to say the least. We managed to see 14 votes in this poll, which is pretty good for a mid-season poll here on the blog, and 13 of those votes suggested that people didn't want Avery on their favourite team. I wonder who the one who did want him and for what team. Before I get to this week's poll, I thought I would just remind everyone just what everyone thought about the Devils would do without Martin Brodeur, now that he has returned to the Devils' practice this weekend. During Week Seven, I asked how well you thought they would do in his absence and the abundantly clear view was that the team would stay about .500 with Kevin Weekes in net and that they wouldn't go out and deal for a goalie. Well, I can tell you, only one of those statements was right, as the team didn't make any deals for a goalie. Instead of Weekes, however, it has been Scott Clemmensen taking the bulk of the starts and he alone has gone 24-11-1 since Brodeur went down. In the same theme as the Devils question thirteen weeks ago, I want to know what you think of the Oilers' situation, now that they have lost two of their most offensive defenders in Lubomir Visnovsky and Denis Grebeshkov. Review the possibilities and make sure you vote! In our record week of points in the pool, we actually didn't break any single team records for highest points, but we came awfully close. Our highest point total in a week is 44 points, which happened twice, but Clayton, our Mover & Shaker for the week, only had 43 points, which was close, but no cigar. On the plus side, Clayton re-joined the race for the money and helped make everything close again at the top, which was highlighted in our Headline. Clayton managed to leap frog into 4th place from 5th last week with his big week and now sits 7 points out of the money. Having a big week for Clayton in Week Twenty were Zach Parise (8 points), Joe Thornton (7), Kevin Bieksa (4), Steve Mason (4) and Brian Elliot (4). All but one player on his team managed to get a point this week, but Dan Girardi hasn't registered a point in weeks, so it shouldn't come as a big surprise. When you look at his top players, three of the five were Waiver Draft pick-ups, so they are important to get right. The prize of the week is a Loui Eriksson jersey card from Upper Deck, which is a hot little number. For Week Twenty-One, we'll move back to a gold victory card, seen to the right. Featured on this card is Jonathan Toews, a 2009 All-Star Game starter and a Draft pick of Derek's. 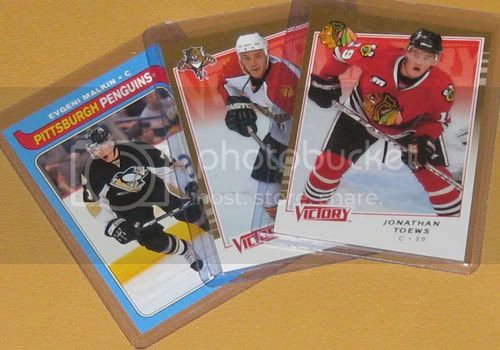 Just in case you were wondering what the O-Pee-Chee retro cards were looking like, I have included the Evgeni Malkin retro card in the picture, just to give you an idea. Pretty cool, eh? On the Sheet, we had seen some pretty big scoring weeks there as well. Moving & shaking on the Sheet standings was Ryan, who had a week-high, 89 points, and moved up four positions to 9th place. That's a pretty substantial week, as he nears the money in the Sheet pool. Ryan is now only 22 points out of the money positions coming into Week Twenty-One, which is certainly achievable with a few more weeks like this. Having a big week for Ryan was Miikka Kiprusoff (8 points), Matthew Lombardi (7), Todd Bertuzzi (6), Brian Rafalski (6), Marian Hossa (5), Rene Bourque (5) and Alex Ovechkin (5). Well, in order to have the chances of winning this pool increased, teams had to catch our leader, which was made a lot easier when he became the Basement Dweller for Week Twenty. John B., only finished with 15 points in a record week for points, which is terrible! His lead is now only 4 points on both second and third, so there is all sorts of chances to lose the lead, which he has and has had for twelve consecutive weeks. Last season, Chris gave up his lead after eighteen weeks and wasn't able to get it back, so John hopes it isn't quite this bad. John didn't seem to have to make any changes to his line-up during the Waiver Drafts, but that seemed to be a little too presumptuous, as he didn't get points from five players, including Manny Legace, who fell from grace in St. Louis and is currently in the minors. It's going to be interesting to see how well he'll fare in the last eight weeks of the season and whether or not he can keep his lead. On the Sheet, there are shakers and there are dwellers. This week's Basement Dweller, is Neil, who I believe has been in this position before, but now I'm feeling a bit rushed to get his newsletter done, so I won't go looking for that sort of information. Anyways, Neil was tied for the most spots lost in the standings with four and had the lowest point total in that case, with 48 points in the week. Neil has now dropped down to the 28th position in the standings, but he has hovered around that position all year, so there has been lots of jockeying between teams around there. In order to get that record week of points in the Draft, there is bound to be some high scoring players participating, wouldn't you think? Well, you're right. There was plenty of high-scoring players and impressive weeks for goalies as well. The most impressive of the bunch was another Waiver Draft pick-up... the first pick of the second Waiver Draft, in actual fact. Scott Clemmensen and the Devils had a great week, winning all four games at home and Clemmensen won three of them, two of them by shutout. That's 10 points for the Waiver Draft pick-up of Grant's, who helped him along to only being 21 points from being out of the basement completely. If Grant can swim his way out of the basement, he'll likely have a guy like Clemmensen to thank for that. Unfortunately, Clemmensen's reign in the Devils' net could be quickly coming to an end, as Martin Brodeur is back at practice for New Jersey and could find his way back into the starting rotation. Clemmensen may get himself a few more starts to ease the load on Brodeur, which would make sense, since Clemmensen has been a star in the net in his absence. Stay tuned for the developments here. Well, how much colder could Carey Price possibly be? After coming back from injury and his appearance in the All-Star Game festivities, he has only managed to win two games and those were weeks ago. Last week, Price wasn't able to win anything, as now Jaroslav Halak has taken the reins in net and played last night against the Canucks, which didn't fare too much better. This slide has not been good for all Price holders in the Sheet and for Grant in the Draft. Funny, he has both the Player of the Week and the coldest player in the week. On Sunday, Tim Gleason, a Box 29 defenseman, was a healthy scratch for the Hurricanes, or so we are to believe. The Hurricanes keep on waiving Frank Kaberle, but he still figures into the line-up as he did on Sunday. Gleason and Kaberle could very well be a rotation in the line-up or either one could be available on the trade wire. Looks like some bad news for the Chicago Blackhawks, as Patrick Sharp left their game on Saturday night against the Dallas Stars with a knee injury. As of Monday, there has been no word of the severity about his injury, but stay tuned to the blog to see how Larry's forward in the Draft will fare. Also out on Saturday night was Craig Adams, who was a healthy scratch yet again, after playing another game in the season. Well, it looks like Darcy Tucker got some rest on Sunday, as he didn't dress for the Avalanche against the Red Wings. Good thing too... maybe his old legs wouldn't have been able to handle the free-wheeling game that they had against the Red Wings and he surely wouldn't have figured into the shootout. The Red Wings decided to let Chris Chelios play against the Avalanche, which unlike the Avalanche, likely should have rested the old legs. So to let Chelios into the line-up, the Red Wings scratched Brett Lebda and gave him a day off. Lebda will likely figure back into the line-up fairly soon, as Chelios likely won't play too many games this year. The Predators didn't dress Box 5 forward, Radek Bonk, on Saturday night against the Bruins and it is believed to be have an upper body injury, which he suffered in a game versus the Blues earlier in the week. The coaching staff does not expect to be without Bonk for any more games, as they expect him to be in the line-up on Monday night. Chris decided to pick up a couple veterans in the Waiver Draft a couple weeks ago and he did run the risk of easy injury. Brendan Shanahan was one of those risks and he didn't play on Sunday because of a foot injury. Shanahan is only listed as out day-to-day, so the injury may just be a rest for his aging body. I would think that to be a fair guess... unless this is the start of a long-term thing. Also out of the line-up, Paul Martin was a healthy scratch on Sunday as well. He'll likely figure back into the line-up soon too. Bad news for the Rangers, as they lost Box 29 defenseman, Paul Mara, for what looks to be the long-term with a shoulder injury. Mara suffered the injury when he engaged in a fight in their game against the Flyers' Arron Asham. Mara left the ice, not to return, with the injury and we are just awaiting word that he'll likely be out for a long time. The weekend's action for the Flyers started with a little flu bug problem, which kept Antero Niittymaki out of the line-up for the game against the Islanders. The Box 32 goaltender has seemingly earned himself the number one job in Philly for the time being. That hurts the Martin Biron business, but luckily for him, Biron will be the starter in Niittymaki's absence. Niittymaki also sat out with the flu on Sunday afternoon against the Rangers, which gave Biron another start. The flu bug has also hit the San Jose Sharks as they make their way through the Eastern seaboard. Dan Boyle was the victim of the flu bug as the Sharks took on the Devils on Sunday. Boyle missed out on one hell of a shootout, as the game was 6-5 for the Devils. That was a good game to have players in, because quite a few of them registered multiple points. Boyle, a Draft pick of Derek's, couldn't cash in there, but should be back in the line-up this week. With Alexander Semin figuring back into the line-up on Sunday, after missing a couple games with an undisclosed injury, Michael Nylander was scratched to make room for the young Russian. Nylander has figured into the press box yet again, as he has been a favourite to ride the pine in Washington, since the team is so deep down the middle. Finally! It's time for the greatest unofficial national holiday in Canada... Hockey Day in Canada! The full day of CBC hockey coverage begins at 10am MT, as the CBC looks at hockey stories from across our great frozen nation. Then we move onto the great tripleheader of hockey that is nothing but Canadian teams. Thank goodness the NHL decided to revise their schedule making so we could ensure this day happening again and again. First we start in Montreal, where the struggling Habs will host the resurging Sens. Brian Elliot and the big three are starting to make an impact on their opponents and they are beginning to look like the Senators of days old. The Canadiens are still trying to find a way to increase their offensive output and they'll need guys like Alex Kovalev and Saku Koivu to start leading the way. In the 5pm game, the Canucks travel to Toronto to pay a visit to the Maple Leafs. The Canucks are starting to find their form and they'll hope that Mats Sundin will enjoy returning to the Air Canada Centre. The task of keeping them in check will be put upon Vesa Toskala and the Toronto defense. The question is, will there be some deals done to help solidify the team. Finally, the late game will see another installment of the Battle of Alberta. The Flames will travel to Edmonton for a game against the Oilers. The Flames are riding a bit of a roller coaster of ups and downs, but it seems like Miikka Kiprusoff is becoming the real deal again, leading all goalies in pool points this season. The Oilers are also in the running to look a little different by Saturday night, as injuries have decimated their blueline as well.